When you review the photos you took all weekend and realize they are mostly alcoholic beverages, you are either doing something very wrong, or very right. I'm going to go with "very right." Thursday night margaritas and bottomless chips and salsa with some fine ladies. After, we went to the bar for trivia but had a hard time focusing on the questions because the spelling bee championships were on. We gasped and cheered and clapped, and I finally understood why people watch sporting events. I don't usually like lagers - I'm more of an ale and stout girl myself - but this beer is delicious on a warm June day, especially if you are sitting in the shade and supervising while your husband helps your friend build a very long, very tall fence. I plan to bring this beer to the beach all summer long. Sauvignon Blanc, sipped on Nicola's balcony at her new (nearly) beachside apartment. Once it was dark and the bottles were empty, we walked down to the water and enjoyed the feeling of sand between our toes. I really love living near the ocean. And just in case you think I did nothing but drink this weekend, you are almost, but not quite, right. 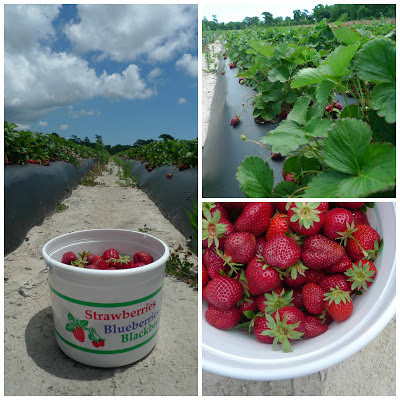 I also went strawberry picking with Nathan, so that I can stage a second attempt at jam-making. While the all-fruit recipe I followed is great in baked goods, it makes for a very strange PB&J. This time, I'll use sugar and hope for the best. I also spent a lot of time writing, reading, and visiting with the chickens. Georgia and Polly move around too much for portrait sessions, but Alice seems to enjoy a good glamour shot. And the little chicks aren't so little any more! They've had all their feathers for a while, and have finally learned to go upstairs at night. In fact, they spend most of the day running up and down the ramp (when they're not eating, drinking, or napping in a pile, of course). I think we may have a rooster in the mix, but I'm going to stay in denial until I hear some crowing. Overall, a quiet weekend with a good balance of work and play, which helps a lot with the whole Monday thing. Before I go (I have a full day of reading for workshop, making jam, and practicing yoga - it's a hard life, I tell you) I wanted to thank everyone who filled out my reader survey - your responses have been far too kind and sweet, and you're all basically the greatest people ever. The survey will stay open until Friday, and then I'll do a drawing for the prize, so don't forget to leave a comment on the post for your chance to win. So far only a fraction of people who took the survey have entered, so the odds are in your favor.